His mouth is a dark cave bats dare not enter. When dragons cease to prowl the skies, the skies shall prowl themselves. 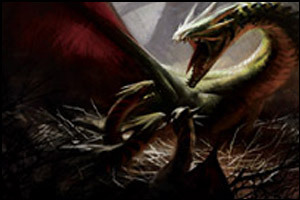 When the undead of Grixis rose from the ground, the Bant army knew they must not fall to it. An artificial world will treat all entering humans inhumanely. The sky trembled. The earth shook. The soldiers gasped. Alara had risen. When Bant soldiers ventured into the land of metal, many gave up their weaponry and social lives to study the beings there intently. It became known as Esperger’s Syndrome. If the Grixis shall be upon us in the morning, then let us be on them tonight! Tree trunks, Gooble? No! Those are legs! If by the pike you live, it is by my axe that you shall die! It was in the night. There were whispers. And then there was nothing. You say your sword is hewn upon my anvil? Well then, boy, answer why has it not already cleaved your soul? Look at that, son, and understand the beauty around you. The Grixis may be undead, but we will be sure to remedy that very soon. Carry with you this, for this will with you go and forever heal your aches that you have. Before them lay the largest feast they had ever seen. Fruits and meats of every kind stacked one upon the other in a display of the greatest of Naya fortunes. They ate it and were full. For thousands of years the only thing he could think to do with his axe was cut trees. That was before Alara rose again. No tree grows taller than the Bulbubabblebibububba can see. With the growl of the foxfire, with the snap of lizard jaws, with the cry of its victims, it was born. Beware when the Axipolosis appears at rest, for it is anything but. I have crushed the skulls of thousands, but what do I do about this? If you wish to know the sound of the rain, roll a ball down a hill. Once it stops, you will have your answer. He’s the most baleful zombie that ever baled. Death is afraid to walk in the valley of the shadow of him. She is respected for her power and wanked-to for her beauty. There are 7 words on Jund for “kill” but it doesn’t know any of them because it is a dog and dogs cannot talk. The filigree drake flew majestically through the air just as a brick wouldn’t. His comedy routine is the funniest in the world – too bad the only people to ever hear it are his victims. The ground shook. The earth trembled. The universe imploded. The summoning was complete; too bad it didn’t matter because the universe had imploded. The beast was so large that it warped the space time continuum. Men have been lost in its orifices, never to be seen again. The creature slithered through the murk, and the murk shuddered. The Grixis have no words for “want” in their language. Only “take”. When the angels entered the battlefield, the enemy scattered like rice thrown directly at the ground. Awakening to the sight of Rashada, Queen of the Sphinx is like awakening to your own death. Neither is pleasant, and neither is possible. The fortress often becomes a cage, but what happens when the cage becomes a fortress? For the denizens of Jund, the presence of clouds on the horizon can mean only one thing: a storm is coming. Naya is home to millions of different unique organisms, but the ones that survive the longest are the ones that never die. Grackhorn awoke with a thud! Was it a goblin who awoke his slumber? No, it was an orc! The beasts of Chilxozoloth are so enormous, even the giants of Westfalthorn look like Ortrantus fire ants. The children of Bant worship the Sun at different intervals. If the sun is highest, that means lunch, if it is in the west, that means it is time to get ready for sleep. He had been called many things in his lifetime. Gargantuan. Merciless. Unforgiving. But nobody ever called him what he secretly wished they would: Pookie. The only thing louder than fury is silence. In unlife, the only death to fear is resurrection. A deviant in Bant; A Casanova in Grixis. As the planes fused their primal energies, something something, here’s a huge monster. Its favorite game as a child was hide and maim. The Sapro traders would sell their own mothers for half a squizz, if only they didn’t reproduce asexually via spore clouds. His is the deadliest touch of all: The touch of death. Few dared to stand before it. None were able to stand after it. Where dragons once hunted, now sphinxes held council. The average peasant still went through pretty much the same crap though. The air became fog, and then the fog became a tomb. 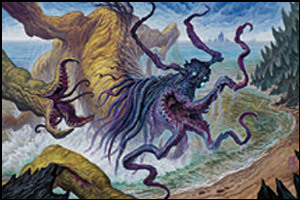 The transplanted grixis bacteria quickly adapted to feed on etherium. Today over 12 million mages are infected. But by paying for artifacts marked with the blue sigil, you can do your part to help fight this disease. In Naya, if you are not swift, your death will be. Part Etherium, part chimera, all gladiator. 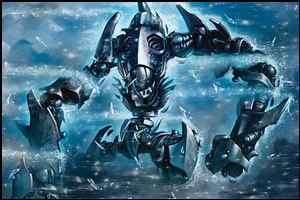 The only constants in Grixis are undeath and untaxes. How do you stop a Rhox from charging? Take away its energy chamber. The life of a hellion is like its body: nasty, brutish, and impossibly long. It appeared to be a harmless plant, and it was. Spovochs: I bet you can’t be eaten by just one. It cannot spell, only counterspell. Forced to decide between death and madness, he chose both. The only thing that lives on Naya is an incredibly diverse set of plants and animals. Its claws were like the BlendTec Total Blender; their bodies were like 4 oranges, 2 ounces of vanilla coffee creamer and 10 ice cubes. It could not feel pain. It could not feel remorse. It could only feel ~*love*~. 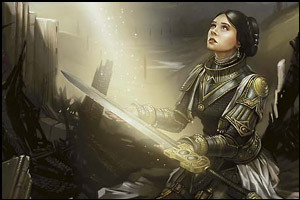 There are no laws in Bant, but there is a complex code of honor and a plethora of mores that are functionally equivalent. Its coming heralded the end a vast empire which we forgot to mention existed before this flavor text.